And what better way to end this blog series of macabre religious art with a picture of an artistic vision of hell? 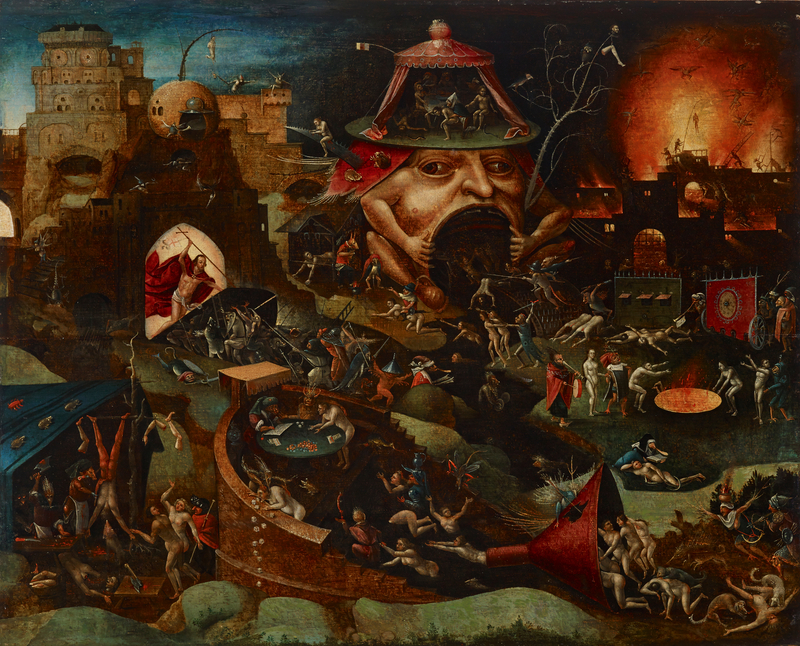 Religious artists have been remarkably… er… creative when depicting scenes of hell. And by that, I mean that their creative vision is remarkably good at scaring you with the creativity of evil that is present in hell. And perhaps that’s to be expected… after all, humanity has done some very evil things and there have been many people who have specialized in creating a variety of terrible tortures. Mind you, Ivan’s theory is not true: men could not create the devil. Yet, sometimes when looking at some of the religious artworks about hell, it is hard not to wonder if perhaps humanity has a deeper insight of the hellish than we ought to have. Christ in Limbo, by a follower of Hieronymus Bosch, c. 1575. Indianapolis Museum of Art, Indianapolis, Indiana, United States. If you want to see it in even more horrifying detail (though I am not sure why you would want to if you didn’t have to! ), the Indianapolis Museum of Art has generously put a super high quality scan here that you can look at. It is a horrific image. While it’s supposed to depict Christ entering limbo, such as this picture featuring Christ descending into hell, Christ does not appear to have anyone who is willing to follow Him out into heaven. Everyone else seems to be suffering from the tortures of the damned who are trapped in hell forever. People getting their limbs severed off. People getting eaten by animals. People being hung from trees. People being forced to eat and vomit repeatedly. People getting burnt in vats of molten fire. People getting sawed in two. People getting ridden by demons. People getting their skin flayed off. …and I’m pretty sure I’m missing several other tortures. It’s an absolutely sickening piece of work, especially when you realize that this is a human’s depiction of what hell could be like. Because it’s not really hell. The real hell is probably much worse. Still, Christ appears in this picture nonetheless as a reminder that He has defeated death and will stand as an advocate between us and Satan. And He is much more powerful than Satan ever could be. And that’s why we celebrate Halloween in the way we do! We wear masks and costumes as a tradition to mock the power of Satan, because Satan has no power over us, as long as we follow Christ. So, have a wonderful Halloween! Be safe, have fun wearing costumes, eat lots of candy, and remember to follow Christ, always! Thank You for standing as an advocate for us against Satan! Protect us this Halloween.